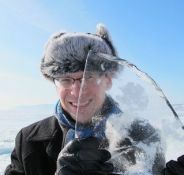 My name is Andrey Petrov and I am a social scientist with a 'circumpolar' career; I was born, raised and educated in Russia, recieved my PhD in Canada (Toronto) and work as Associate Professor of Geography and Director of the Arctic, Remote and Cold Territories Interdiciplinary Center (ARCTICenter) at the University of Northern Iowa, USA. I am the Vice-Chair and U.S. Representative on the IASC Social & Human Sciences Working Group and Past-Chair of the Polar Geography Speciality Group of the Association of American Geographers. My research primarily focuses on economic issues in northern communities and policies of regional development in the Arctic. A also study human-environment relationships and Arctic socio-ecological systems. I lead a number of circumpolar research initiatives, most importantly the NSF research coordination networks in Arctic sustainability (Arctic-FROST and Artic-COAST). I have also been participant of the Arctic Social Indicators, Arctic Human Development Report, ReSDA and other major international projects. I was privileged to be first elected to the IASSA Council in 2011 and since have directed my efforts to supporting representative and transparent gevernance process in this thriving organization.